Can tragedy turn to opportunity? An unexpected loss into new life insights? To tighter family bonding? Pain into lightness? Suffering, into release? Our family has just been through a gut-wrenching wringer – and I’m sure most adult readers have been through similar situations, themselves. The experience of living intrinsically includes that of dying – and the witnessing and easing the pain of death. Ugh. Sixty hours of strained breathing. Sixty hours by sister’s side, supporting her however we could. This was life and death and I’m walking away from it a changed person. My sister suffered a serious stroke in her home two and a half weeks ago. Taken by ambulance to Henry Mayo, she was quickly intubated to restore breathing. Later that night, an emergency surgery removed pressure on her brain and off she went into the HMNH Intensive Care Unit (ICU). She’d remain there for eleven days, undergoing tests, managing blood and fluid pressures and assessing outcomes. We initially maintained hope for some sort of a positive outcome providing my sister with a meaningful existence. We accepted any outcome would be hard work ahead for all. Sister would be paralyzed, at best – and vegetative or brain dead, at worse. After a few days, we observed slight movement on one arm, maybe a slight tracking of her eyes. But these hopes faded as any faint signs of awareness or cognitive activity ended. Her stroke was life-ending without permanent artificial intervention. HMNH has a palliative care unit, providing “comfort care” to those patients working through various incurable conditions and transitions in life. Ultimately, a meeting was called with these kind folks along with our neuro surgeon, social workers, the hospital chaplain and our own concerned family members. Options were openly – and painfully discussed. “What would sister want?” “What would be ahead in each different fork in the road?” Tough choices discussed in a caring environment where family is compelled to think on behalf of the patient no longer capable of thinking and communicating on their own. These are some of the hardest decisions any of us will ever face. Our family has long been cursed with a genetic ataxia causing a slow degradation of motor function, akin to Lou Gehrig’s disease, but far slower with greater suffering. Sister and I had cared for my father while he spent years, immobile and non-communicative in a convalescent hospital. Later, we cared for our other sister suffering that same disease cycle. All our extended family knew without doubt that this, my last sister, would never want to be warehoused, unconscious, a body waiting for a certain, suffering death. The decision was made to let nature take her course in the here and now. And so, the breathing apparatus was removed mid-day Friday and, plainly spoken, my sister’s “death watch” began. Family members remained by her side, holding hands, caressing, chatting, remembering stories, even joking – supporting sister in any way possible. Minutes turn to hours to days and sister’s stoic friends remained by her side nearly twenty hours a day. The Henry Mayo ICU is a remarkable place. One sees a world of activity, reclaiming life from death’s attempts. Computer screens abound. One in each room, on at a station between every two rooms, undulating desks with nurses and workers attentively monitoring and studying. Information is constant updated, analyzed. Every treatment, every injection, every test – all recorded by bar code, all accessible, trackable – all into the mix for patient analysis for best possible outcomes. There’s constant hum surrounding this life and death effort. Filtered air constantly flows into each room. The breathing machines, the automatic blood pressure cuffs, the mechanized drip, drip of morphine… combine to an ever-present, dull humming – a background to the background of soft classical music intended to relax ICU patients. There is not enough good that can be said about the excellent and very humane staff caring for sister – and truthfully, us – through the entire process from entrance to the hospital to sister’s eventual unfortunate outcome. One evening I came to the room unexpected to find a kind nursing assistant sitting with my sister, holding her hand in the darkened room. We expected clinical expertise. What we got was also most supportive and kind interactions from everyone. Through very intensive care – the HMNH ICU assists in the present-day miracles of “bringing people back.” It didn’t happen this time and in the end, no one could have made sister’s outcome any different. But our family has the peace of mind that everything reasonable and remotely practical was supplied to her to the best modern standards. Demand at the HMNH ICU remains high, and sister was transferred to a regular room for what would be her last day on earth. Again, we stayed into the night, and finally left to restore ourselves. Shortly thereafter came the very personal call from sister’s head nurse, “I’m very sad to inform you that your sister has passed.” We all quickly drove back to HMNH. We paid last respects and hopes and prayers. We hugged with teared up nurses who asked us to contact them for anything that would help. We returned back to the ICU to inform that kind staff of sister’s passing. Hugs abounded again, with nurses who had become concerned friends. Sister has passed her suffering. Our family is spent. Sorrow is turning to lightness again. And through it all there’s a greater commitment to fully living life while it remains. And, a deep appreciation for all those caring folks we came to know and love along the way. Here is a very soulful “thank you” to the community of caregivers at Henry Mayo. Gary Horton is a Santa Clarita resident. 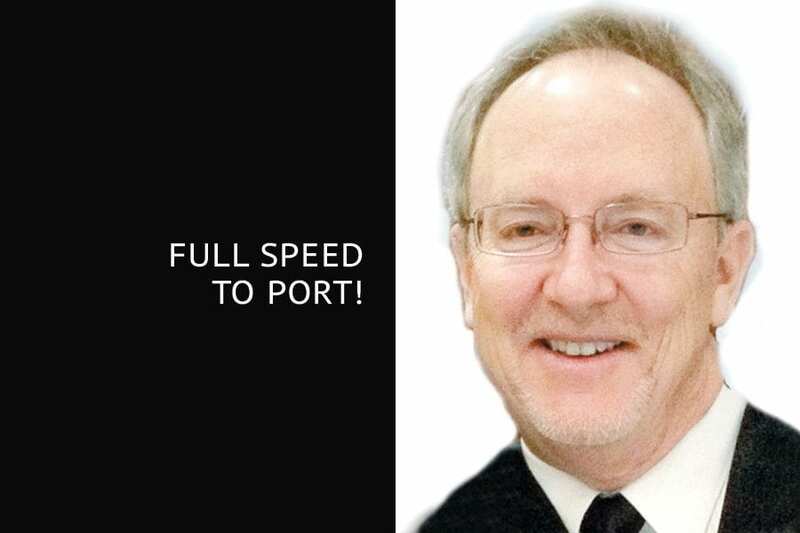 “Full Speed to Port!” appears Wednesdays in The Signal.